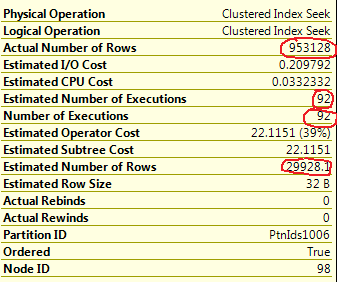 We recently migrated a database from SQL Server 2005 X86 to 2008 R2 X64. Running an Enterprise Edition License, we were able to take advantage of partitioning. It had several tables with similar structures; row count north of 2 Billion rows. Unique constraint: TypeId, ContentData. Added InsertionDate to comply with partitioning requirements. Table had a partition per month. On the first week of each new month we marked the previous month partition as read-only. A one-time File backup was performed to the previous month partition. The current months’ partition would be the only piece left in Read-Write mode. Table 'sampletable'. Scan count 92, logical reads 7613, physical reads 223, read-ahead reads 7808, lob logical reads 0, lob physical reads 0, lob read-ahead reads 0. Table has a partition per TypeId (range of 50 items each, e.g. 1,2, … ,50). Searching for a particular TypeId + ContentData generates a unique index seek plan, 1 scan count (1 partition). Table 'sampletable'. Scan count 1, logical reads 5449, physical reads 66, read-ahead reads 5445, lob logical reads 0, lob physical reads 0, lob read-ahead reads 0. The table is mostly used for retrieving and comparing data. The retrieval call will always pass in TypeId as parameter. 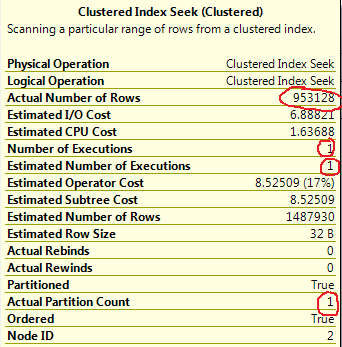 The system now performs an index scan for 1 partition (1 scan count). For data comparison, an index seek is performed for a unique value under 1 partition only. Data compression reduced I/O reads by 50%. In the past, data extraction and comparison scanned through all the partitions generating excessive I/O calls, but we did not need to worry about continuously backing up older partitions as they were already flagged as read-only and backed up. With this exercise we have effectively increased performance at the expense of maintenance. Well worth the change.